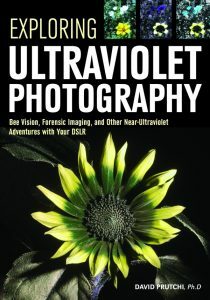 My new book “Exploring Ultraviolet Photography: Bee Vision, Forensic Imaging, and Other Near Ultraviolet Adventures with Your DSLR” is now available on Amazon for pre-order. In this book, I will show you how to select equipment that allows you to capture otherworldly UV images. You’ll learn how to use filters that block visible light and prevent infrared light leaks and will discover how supplementing or overpowering sunlight with artificial UV light sources can help you create stronger images. You’ll also learn postprocessing techniques designed to enhance your UV photographs. There is much to discover about the world as seen by bees, birds, and butterflies (and other creatures). I will take you into the wild to capture UV images that show how flowers advertise their nectar with beautiful markings to attract pollinating insects and birds. You’ll also discover how butterflies that look dull in visible light burst with intricate, iridescent patterns in UV. Finally, you’ll learn about the scientific, medical, and forensic uses of ultraviolet photography.